Hmmm....how about Blarg? Taken? Dang. Gutslicer? Nope. Hobblefoot? Darn. Kneebiter? Shoot. Blooddrinker? Slayer? Sleigher? Slaayyur? Crud! Fine. PookieMcFluffyweiner! WhaddayameanNO?!?!?! I also had some names I'm not proud of. Fluffyspooge got past the naming bot somehow. She was an Undead priest and a GM made me change names at level 15 or so. She became Braaaaains. But I'm not here to talk about the good times I had in WoW. I'm here to talk about tiny people. Dwarves. Or, dwarfs if you prefer. 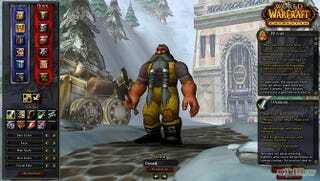 Since dwarfism is a recognized medical condition, I call them dwarfs. Not 'Tiny People'. Not 'Vertically Challenged'. Not 'Midgets'. And I don't toss them. But, before we get into the dwarf thing, let's not forget today is Tell The Truth Tuesday! I finally spill about yesterdays subject. And I know you all have been waiting on tenterhooks for the answer. I lied. But not by much. I took actual butter facts and changed them slightly. Butter was discovered by the Scythians who were living in Germania at the time. They would skin a goat and stich the skin up, leaving a leg open to pour milk into. Then they tied it to a pole in their tent and swung it around until they had butter. It was softer and creamier than what we have, and it didn't have salt. But it was butter. The Romans did cook with it. But they also used it as a base for their perfumes. Some cultures used it as a hair styling gel. While it was used to sooth a teething baby, it wasn't used anywhere else as a medicine. While the early users did cook with it, it was true that real heavy use of butter in cooking didn't happen until much later. Like, early 19th century. It was then that wooden barrels were designed that were virtually air tight,meaning butter could be kept for long periods without going rancid. It was the addition of salt to the butter and the innovation of the butter churn that really started butter off with the public as a cooking ingredient. I want to tell you about one young man. His name was Jeffery Hudson, and he was born at a bad time, 1619. It was a bad time because his parents were poor. And poorness never really worked out for most people. Within a few months of his birth, his parents knew something was wrong. Little Jeffy wasn't getting any bigger. He stayed small. In fact, he grew to be about 18 inches by his 4th birthday. But other than the fact that he was so short, he was a perfectly proportioned little version of a bigger person. Too bad for Jeff that the only job open to him at the time was as a freak show worker. And in a way, that's what he became. When he was 7, his parents introduced him to the local duchess as an oddity of nature. This wasn't out of malice, you see. His parents knew that his very future depended on that meeting. Luckily for Jeffe, the duchess was enamored of him. She invited him to join her house and become a part of her court. Before you start feeling sorry for Jeff, and wonder what kind of monsters his parents were for giving him up like that, don't. This was actually the best thing that could have happened to him. And his parents knew it. The duchess would provide for him as a member of her court. He would eat well and not have to toil at hard labor like he would if he stayed with his parents. A few months after he joined the duchess court, the duke and duchess entertained the king and queen. The queen fell head over heels for this child. Jeff, you see, had begun his training as a Court Fool. Stop the outrage. This was the early 17th century. Fools were everywhere. There were three kinds of fools; Natural fools, or those who were born with a mental deficiency; acquired fools, or those who chose to become a fool as a profession, not unlike a modern day stand up comic; and the fair fool, the guy who worked at the traveling fairs or at the local inn. Natural fools were not regarded in the same light as the other fools. They were broken people who, if they were lucky, lived in a caring community that tried to take care of them. Fair fools were the ones who sucked. The would never make it big, and they were stuck doing low paying jobs wherever they could get them. If they were lucky, they might get steady work as the entertainment for a tavern, and in compensation, get a straw bed in the hay loft and a meal or two a day with an ale if they were lucky. Acquired fools, (which fair fools technically were), had it the best. And Jeff was the highest ranking of them all. The queen had the duchess turn him over to her, and he became a courtier for the queen. Jeff was set for life. As a part of the court, he was required to be well educated, well fed, well dressed and able to play cards, dance and be skilled with pistols and swords. Jeff was doubly blessed. Not only did he become a member of court, he was by all accounts, a handsome young man. He was intelligent and had a sharp wit. He grew up in the court of the queen, and he fit in well. Before you ask, no. The court fool dressed just like other members of court. The brightly colored, mis-matched clothes with bells sewn on and the tri-point hat are just hollywood myths. No respectable lady or lord would allow someone so garishly dressed to be in their court. Other than his height, there was no distinguishing him for any other courtier. Everything was fine and dandy until 1642 when war broke out. And not just any war, a civil war. While the king led his troops, the queen fled with a select few to the Netherlands. But she hated it there. So after a few months, the went back to England. They never made it back to London because of the fighting, so it was off to France for the group. During the war, the queen decided Jeff should hold a military rank. So she made him a Captain if Horses in Prince Ruperts calvary. And, that might have been the worst thing that happened to him. By now, Jeff was a young man in his twenties. And he took his commission seriously. There was war, and this was not the time for jokes. But, even though he was handsome, intelligent member of court, all the other courtiers knew he was the queens fool. If it weren't for his short stature, he would still be a peasant on the farm, slogging turf for the crown. But as I said, Jeff took his commission seriously. While in France, he made it well known that he would not tolerate any more jokes at his expense. He might have started as a fool, but now he was a respectable courtier, and he demanded everyone treat him as such. Remember, this was a man in his mid twenties, who was about 2 1/2 feet tall. There was no way in hell anyone was going to pay attention to the shrimp. However, the next joke that was cracked, Jeff responded with a challenge. Duels were illegal in France. That didn't deter Jeff. He insisted it went ahead. The man he challenged got to choose the weapons. Thinking the whole thing was a joke, he selected 'Squirts'. Squirts were large syringes that were used for, among other things, water fights. Well, that just pissed Jeffrey off more. On the day of the duel, the opponents mounted horses, (well, a horse and a pony), and starting 100 yards apart, charged towards each other. By all accounts, Jeffs opponent was laughing until he saw Jeff wasn't holding a squirt. He had a pistol. And Jeff had received training in pistols. Jeff removed the top half of his opponents head. And who was this now-dead man? William Crofts. And who was that? Only the leader of the queens protection service. He was also the queens Master of Horses, making him Jeffs commanding officer. The duel was a crime in France, and as a result, the queens entire party could have been expelled from the country. The queen, however, asked for and received permission to handle the punishment herself. As a result, Jeff was expelled from the queens court. This was bad. Bad for Jeff, that is.Having to leave France to avoid jail, he took to ship and was headed for the Netherlands. But his ship was attacked and captured by Barbary pirates. He was sold into slavery in Algiers. For the next 25 years, he toiled as a slave. He gained his freedom in 1669 when the new king, the queens son, sent emissaries to North Africa to buy English citizens out of slavery. Jeff was not able to rejoin his beloved queen, as she died three years before he regained freedom. He did return to London in an attempt to gain a pension from the king, but arrived at the wrong time. Jeff, brought up as a member of the court, means he was brought up as a Roman Catholic. And he arrived in London just as people were throwing the Roman Catholics into jail. Jeff was in jail in London until 1680, when he was released. I'd like to end this on a happy note, but I can't. All that is known about Jeff after he was released from jail is, he spent the rest of his days broke. He died sometime in 1682 and was buried in an unmarked paupers grave. On the plus side, while he was a slave, he did almost double his size. He eventually grew to 45 inches tall. But, I suppose he would have enjoyed not being a slave more. I do have a moral to this story. And that is, no matter how great your life is going, kill one man and you can change your fate in an instant. So.......anyone want to buy me some game time for World of Warcraft?